More than 150 kilometres in length the Transfagarasan Highway is Romania’s most spectacular and best known road and, thanks to an appearance on BBC Top Gear in 2009, now one of the country’s most popular tourist attractions. Fully open only from June to October, the road’s highest point is at 2042 metres: the tunnel which links the northern and southern sides at Lake Balea (Balea Lac). The Transfagarasan - as with everything else in Romania at the time, it would seem - was built from 1970-1974 on the personal orders of Nicolae Ceausescu, who, legend has it, wanted to create a strategic route across the Fagaras Mountains to ferry troops north should Romania be invaded by the USSR (as Czechoslovakia had been in 1968). This legend of course ignores the fact that a perfectly good and far quicker route around the mountains (the Valea Oltului) already existed, and that any strategic impact of a road open for only a few months each year would have been minimal. Still, who are we to question a good urban myth? A far more likely explanation for the construction of the road was the simple fact that the mountains were there, and that the road across the very top would serve as a proud example of just what socialist Romania - with Ceausescu as its leader - could achieve. Much like the Danube-Black Sea Canal project of the 1980s the Transfagarasan was therefore built as a status symbol with little regard for cost or usefulness. (Indeed - whisper it - but the Transfagarasan is fundamentally useless). Yet whereas the Danube-Black Sea Canal is today the biggest white elephant in the country (it carries very little marine traffic), the Transfagarasan has never been more popular. Always a favoured weekend trip for Romanian drivers, its international fame now means that motoring enthusiasts from all over Europe (particularly Poland, in our experience) beat a path here each summer. While the you can just about do the Transfagarasan in a (long) day trip from Bucharest, we recommend taking a couple of days: besides the Transfagarasan itself there is plenty to see along the way. To get to the Transfagarasan from Bucharest, the best way is to take the A1 motorway to the industrial town of Pitesti (best known as being the place where Dacia cars are made). There is little to recommend a stop in the town itself, except perhaps the memorial north of the city centre marking the site of Pitesti Prison. This – along with Sighet in the very north of Romania – was the most notorious of the communist prisons where countless intellectuals and members of the old ruling class were executed from 1948-1954. A much better choice for your first pit stop is in fact Curtea de Arges, a small town 38 kilometers north of Pitesti. It is home to the ruins of the Princely Court (Curtea Domneasca, Open 10:00-17:00) built by Basarab I in the 14th century. While there is not really very much left of the Court building itself, the well-kept church (Biserica Domneasca) is in excellent condition - it was entirely renovated from 2003-4 and open to the public. Basarab I is buried near the church’s altar. A short distance north of the city (and on the way to the Transfagarasan) is the even more impressive Biserica Episcopala Curtea de Arges, part of the Curtea de Arges Monastery. A superb example of Byzantine design, the cathedral was built between 1514 and 1526 using materials brought almost entirely from Constantinople, on the orders of Neagoe Basarab, the son of Basarab I. The DN7C officially becomes the Transfagarasan at the little village of Albestii de Arges, 6km north of Curtea de Arges. The road climbs steadily from here, and by the time you reach Capatenii Pamantului - the last village before the serious hairpins begin - the scenery is already stunning, with the road clinging in places to the cliffs as it passes through a wonderful natural gorge. Capatenii Pamantului (which rather fittingly translates, by the way, as The Ends of the Earth) is home to the ruins of the real Dracula Castle, Poienari, (real in the sense that Vlad Dracul actually lived here for a time. Bran Castle - often marketed as Dracula’s Lair, was never Vlad’s home). You will see the impressive castle high to your left as you approach: you can visit the ruins, but doing so involves a climb up more than 1500 very, very steep steps. It is not for the faint of heart. At the foot of the climb there is a pension, the Pensiunea La Cetate. From here a series of hairpins and three short tunnels bring you to the next landmark on the Transfagarasan, the Vidraru Dam. One of the largest hydroelectric plants in Europe the road passes across the top of the dam (completed in 1966), and offers fabulous views of the Vidraru lake. Just try to ignore the huge ad for a cement company which has been painted without thought for the surroundings onto the rock and, we would suggest, boycott their products. As you come off the dam look out for the electricity pylon disguised as a statue of Promotheus - representing power - on the cliff directly in front of you. If you can find a parking space some steps allow you to climb up to the statue, from where there are even better views of the lake. During the summer there are boat trips on the lake. Lasting 30 minutes they cost 10 lei per person. Departure times are ad hoc depending on how many visitors there are, but during July and August - especially at weekends - you should never have to wait too long. A couple of hundred metres further along the road there is a hotel, the elegant Hotel Posada Vidraru. The Transfagarasan then follows the outline of the lake (and another hotel overlooking the lake, the Valea cu Pesti), the water often visible through the trees on your left. The valley then gets gradually steeper, before climbing sharply, up to its highest point: the 890m long Capra Tunnel, at an altitude of 2042m. (This fact means that the Transfagarasan is not actually the highest road in Romania: the Transalpina further west reaches a maximum altitude of 2145m). Note that there is another hotel along the way, the Conacul Ursului, just before the start of the hairpins on the southern side: its good value restaurant is a decent place to stop for food, as it is usually less crowded than the places at the top. At Balea Lac, just below the tunnel, there are two comfortable pensions (Cabana Paltinu and Cabana Balea Lac) and - in winter - an ice hotel if you want to stay up here the night. The cabins also have good - if not cheap - restaurants. See balealac.ro for more information. In winter there is a cable car which provides access to the cabins and ice hotel from Balea Cascada, as the road is closed. There is also a rather tacky, touristy market next to the large car park at the exit of the tunnel, selling all sorts of rubbish as well as a few decent treats (such as kürtős kalács). The Fagaras Mountains are extremely popular with hikers: this is the some of the best hiking terrain in Europe. There are tens of well-marked routes criss-crossing the mountains, which are also dotted by mountain huts offering basic food and accommodation. At Balea Lac you can pick up a number of routes, including one which leads down to Balea Cascada, and one which goes up to Negoiu Peak: at 2525m the tallest mountain in the Fagaras range and the second tallest in Romania. Do not attempt any hiking in the Fagaras unless you are well equipped for bad weather, have decent boots and have a good map: the Fagaras mountains are not for the casual walker. This brilliant website shows all of the marked trails in the Fagaras. From Balea Lac the 25km drive down the most spectacular part of the Transfagarasan to Cartisoara takes around 45 minutes, although at weekends - when half of Romania can often appear to turn up - it can take double that. As such, we advise anyone planning to drive the Transfagarasan to do so during the week, avoided Saturday and Sunday altogether. There are very few places to stop and take photos (and you will see most people trying to do so by hanging out of their car windows). There are a number of small memorials to those who worked (and died) on the road, but the first main stopping point on the way down is Balea Cascada (the Balea Waterfall). A cable car from here runs back up to Balea Lac, and during the winter (when the road beyond this point is closed) is the only way up. The cable car usually runs during the summer too. At Cartisoara (where the Badea Cartan Museum, featuring a collection of painted glass icons and an old shepherd’s house complete with thatched roof is well worth a stop) those of you on a day trip should turn left onto the DN1 and head for Avrig and the DN7, which will get you back to Pitesti and the A1 in around two hours. 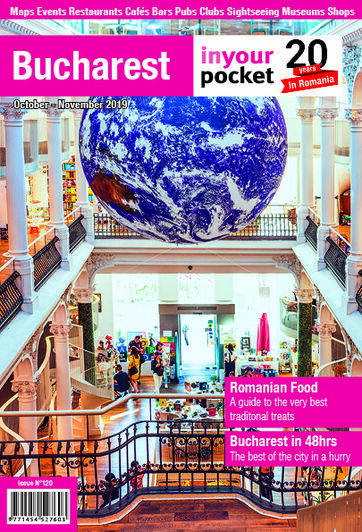 If you are in less of a hurry head for Sibiu, Transylvania’s most fabulous city, just 25km beyond Avrig: make sure you pick up a copy of Sibiu In Your Pocket to help you make the best of your time here. Note that DN7 itself runs along the Olt Valley and is a wonderful drive in itself, especially the part which passes through the Cozia National Park. If you have time stop at the 14th century Cozia Monastery: one of Romania’s oldest. In 1986 stained glass windows featuring the portraits of Nicolae and Elena Ceausescu were added to those of Decebal, Burebista and other great historical Romanian leaders: they have since been removed.